Showings begin Sun 6/12 from 1-3pm. 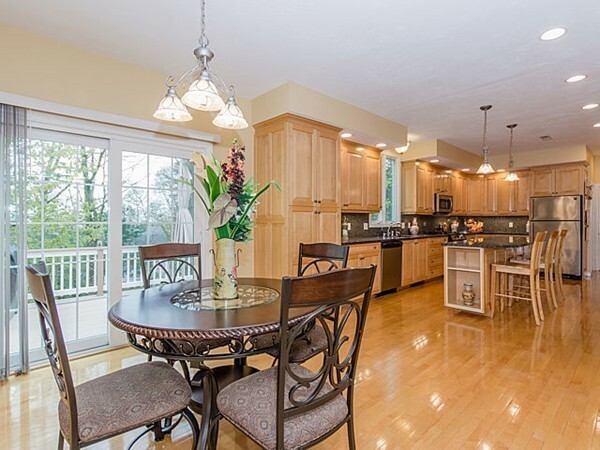 Stunning custom colonial in great Greenlodge location at end of cul-de-sac. Newer construction, this home was built with superior attention to detail and high-end craftsman finishes throughout. Fantastic open floor plan. Entertainer's paradise. Tall ceilings, recessed lighting and gorgeous maple hardwood flooring throughout, molding, dental molding and wainscoting. Custom maple cabinets stretch to ceiling. Kitchen with breakfast island sits 3 comfortably. High end appliances, granite counters & backsplash with under cabinet lighting. Slider to deck overlooking private backyard. Warm family room with radiant heat, fireplace, and wired for surround sound. Vaulted ceiling master bedroom with massive walk in closet, master bath with Jacuzzi and solid cherry vanities. 2 car garage under steps into a massive finished lower level with 3rd full bathroom and separate laundry and storage area. Commuters delight, walk to train. Great shopping nearby.